There's a worldwide sketching challenge going on right now with Urban Sketchers to cover the 2014 Fifa World Cup. Since it's an international event that connects us all in a way, I thought it would be fun to participate. My first finding is this decorated balcony from England fans, ready for the game. They even added red and white flowers matching the colour of the flag. I wonder if they were chosen this way or if it's a coincidence. Out of hundreds of balconies in that area, it is currently the only visible flag from that side of the building. The games officially start tomorrow, it will be interesting to see if more flags show up as the game starts. I'm not too big on sports but from my understanding, Canadians are typically more into hockey than soccer. However, since Toronto is a very multicultural city with Canadians having roots in all corners of the world, I wouldn't be surprise to see flags from various countries appearing throughout the city. 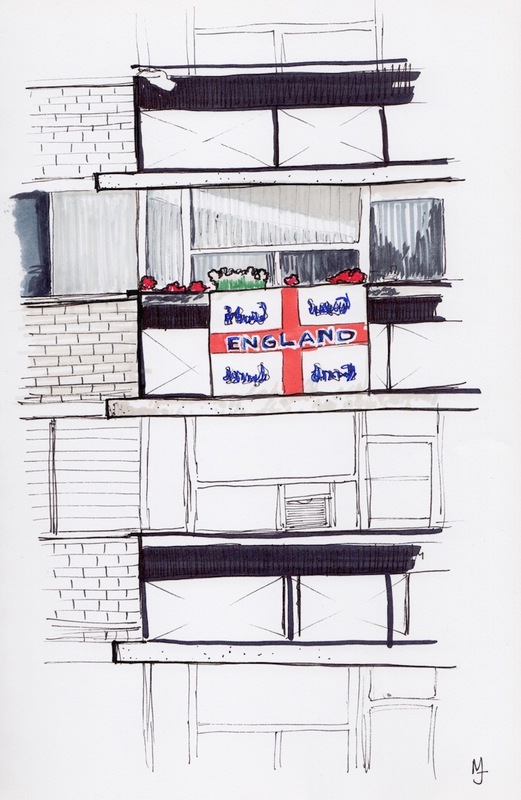 I might have to look at different neighbourhoods to see different flags, but I'll try to keep and eye open and my sketchbook at hand to capture the effect the this years world cup in Toronto. If you're curious to see what other sketchers around the world are capturing, search for #UskWorldCup in various social medias and if you happen to be sketching and posting something related to the world cup, make sure to use that hashtag as well.